There was a really great presentation by James Kang (Cal-Pac Communication Director) on how local churches can use social media to be more inclusive and welcoming; “Don’t DO social, BE social!” Kang also talked of the C-School where local churches can acquire tutorials and tools on the use of the internet for effective outreach and communications. 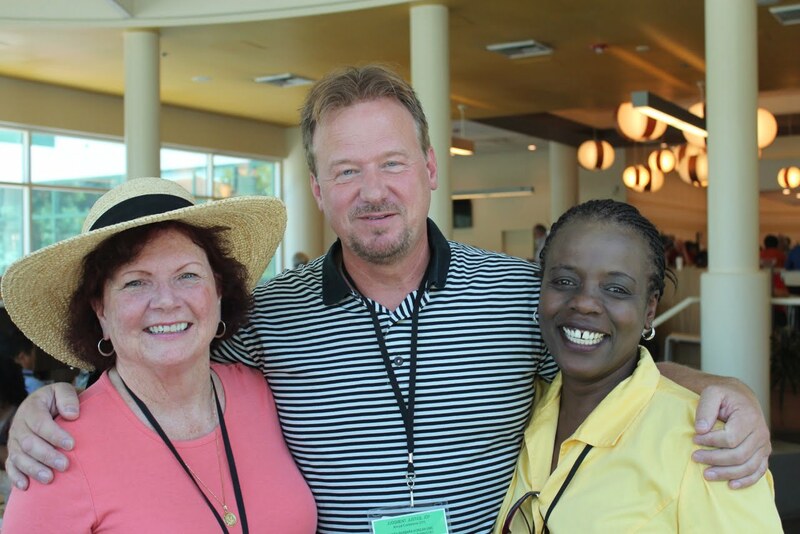 Annual Conference was an educational and spiritual adventure that allowed us to gain knowledge of how the UMC operates in both Plenary and Legislative sessions. It was an honor to be part of these key processes, to be able to vote and to have our voice included as part of change. Chris & Ndinda ran into Rev. Frank Schaefer at Annual Conference! Cal-Pac Conference voted on and passed becoming a Reconciling Conference. While there is review required the fact remains that Cal-Pac has made the statement that we are reconciling. The spirit of that vote cannot be taken away regardless of the judicial council rulings. Ndinda volunteered at the Reconciling Ministries Network booth along with Bruce Baraw, and both of them met and connected with a lot of members from other churches that share the same passion for inclusion as PB UMC does. Connecting with Lay Leaders and Clergy throughout the conference, learning the ropes of the business at hand, gaining a wider view of the needs of our world and being spiritually fed all stand out as high points of the four days. We are truly humbled by the leadership of Bishop Carcaño. Her grace as a Christian, her skill as a leader and her compassion as a person shines through. We are encouraged by where she is leading our conference. To read the full reports, contact the church office.